Wooden cladding is an attractive and modern finish for high-quality buildings of various types, yet the high combustibility of wood can raise concerns. In public buildings as well as private homes, fire protection is becoming more and more important. Our fire-retardant system provides the solution. 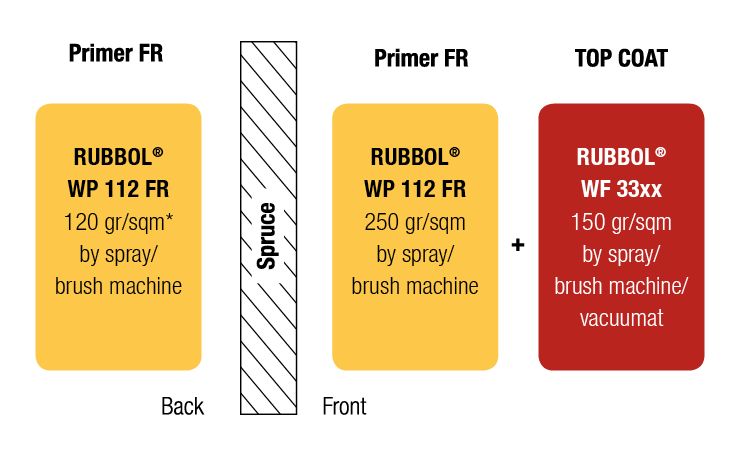 The new off-white sprayable and brushable primer RUBBOL® WP 112 FR in combination with one of the RUBBOL® WF 33xx top coats not only enables spruce facades that comply with EU fire resistance regulations, it also allows beautiful, high-quality finishes. To meet the fire safety standards, the system must be applied as illustrated below on a non-fire approved spruce substrate with a thickness of 19mm or more. Fire testing aims to determine three critical aspects of a material’s behaviour: Reaction to fire, ignitability and durability. Reaction to fire refers to how a material or system contributes to fire development and spread, particularly in the very early stages of a fire when swift and calm evacuation is crucial. This is critical for cladding and panels. Ignitability indicates the ability of a material or system to resist – and ideally prevent – catching fire. This is a key factor in constructions, windows and doors. Durability refers to the capacity of a system to maintain its specifically fire-retardant properties over time. 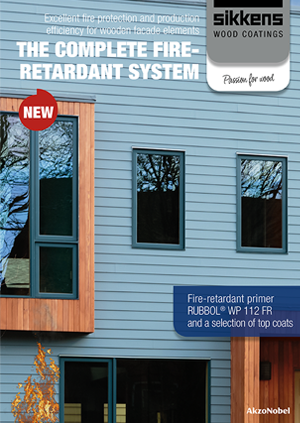 Specially engineered for outstanding fire retardance without compromising appearance, our system using RUBBOL® WP 112 FR as primer and finished with one of the RUBBOL® WF 33xx top coats is approved in Europe in line with the norms EN 13501-1 (reaction to fire), 13501-2 (ignitability) and EN 16755 (durability). It is also approved according to the cladding fire test SP Fire 105. The approval stipulates fire resistance for non-fire approved spruce substrate at a minimum thickness of 19mm. This system is classified as B, the highest fire-retardant rating that can be expected for an organic material like wood. In terms of smoke production, the system is rated s2. RUBBOL® WP 112 FR received the best possible score, d0, for zero formation of burning droplets.